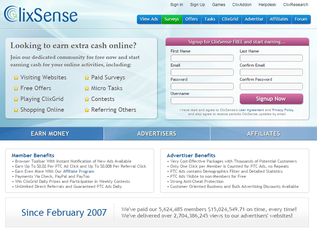 Clixsense since in 2007, The king of PTC with business plan, trusted programs, earn Cash everyday. 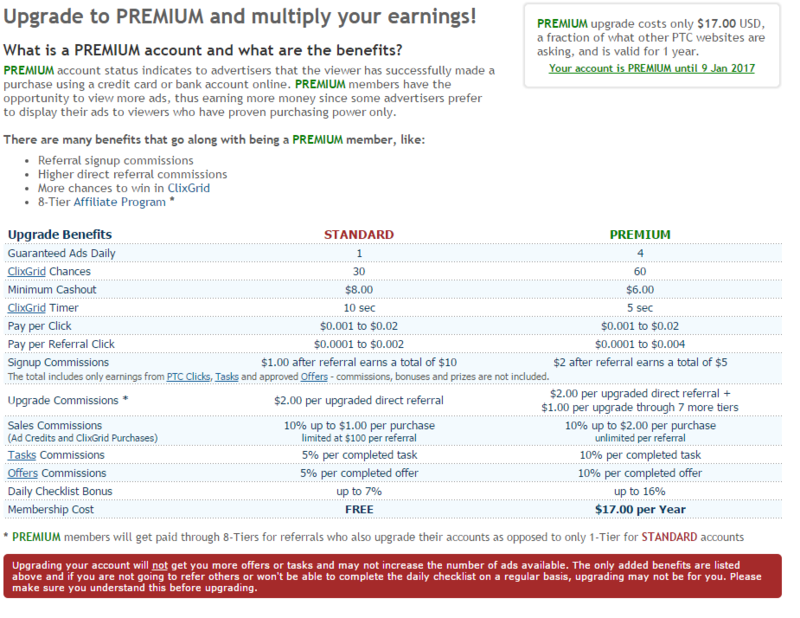 Unlimited direct referrals and guaranteed PTC Ads daily, make $350 monthly from offers easy !! Minimum Payout : $ 6 USD for Premium members and $ 8 USD for Standard members. Members, due to the success of the holiday referral promotion we ran, we have decided to run it again starting today, January 3rd, 2019 10:45AM EST. We will pay you an additional $0.10 for every new referral you signup on top of the regular signup commissions you already receive. Any new referral that signs up, activates their account and completes their profile will generate the extra signup bonus of $0.10 for you. **Please note, any member attempting to create bogus referral accounts will immediately lose their ClixSense account and any money you've earned. Please play by the rules. We have not set an expiration for this promotion and can end it at any time. We appreciate your continued support of ClixSense and look forward to a successful 2019. For the next 13 days (Starting Friday December 21st and ending on Wednesday January 2nd, 2019) we are increasing the daily checklist bonus an additional 50%. During this promotion all members will earn an 18% bonus for completing their checklists! The extra checklist bonuses (ClixAddon and Activity) are not changed and will be added to the regular bonus as usual bringing the maximum potential bonus to 22% for all members! 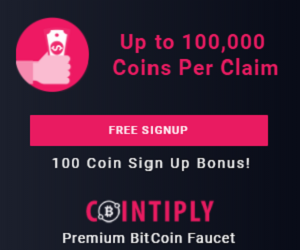 As an added bonus during this promotion we will pay you an additional $0.10 for every new referral you signup on top of the regular signup commissions you already receive. Any new referral that signs up, activates their account and completes their profile will generate the extra signup bonus for you. Thank you for your continued support and we look forward to a prosperous 2019. Members, we have an exciting new affiliate program update for you. For each referral you get from Finland, Sweden, Denmark and Norway we are increasing the signup commission from $2.00 to $5.00 on first $5.00 earned from your new affiliate. We've also re-enabled the affiliate program for China and Vietnam. This means members from these countries can begin growing their downlines immediately. 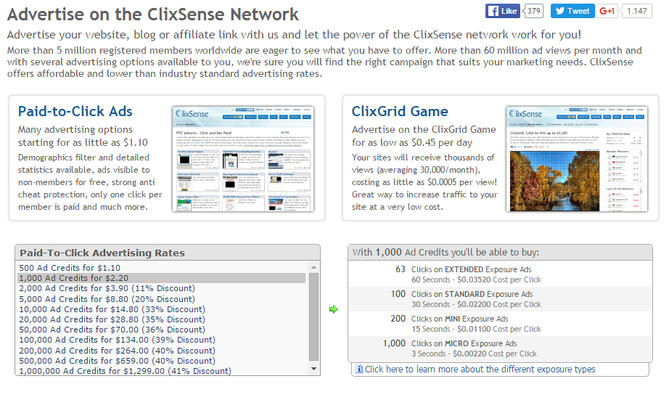 We thank you for your continued support of ClixSense. Members, on Tuesday April 3rd CrowdFlower will be officially renamed to Figure Eight. Nothing is really going to change other than the name. You will continue to access tasks as you have in the past and there should be no interruption of service once this change takes place. We look forward to what the future holds for Figure Eight and ClixSense. Members, we are writing to inform you that there is a delay in processing Payza withdrawals. This short delay happens each time they change the bank we make our wire deposits to. It's usually only a few days before our deposit is credited so hopefully in the next day or 2 this will be resolved. As soon as our deposit is credited we will process your Payza cashout. All other cashouts are being processed without delay. We are offering you landing page for making referrals, You can get free landing page and build your downline. Also, Your referrals can make their downline with our website. 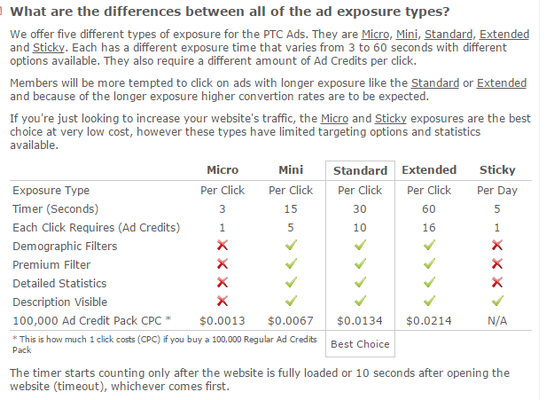 Only Paid PTC Sites appearing on landing pages. Scam reports are checking on hourly basis. 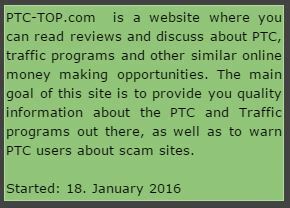 You can add new PTC Website. Members, we have just released an update to our affiliate program. If you have a minimum of 100 or more active referrals with at least one transaction in the past 30 days you get an additional 5% affiliate commission making your affiliate commission 25%. If you have 200 or more active referrals you get an additional 10% affiliate commission, making your affiliate commissions a whopping 30%! This represents an increase of 50%. 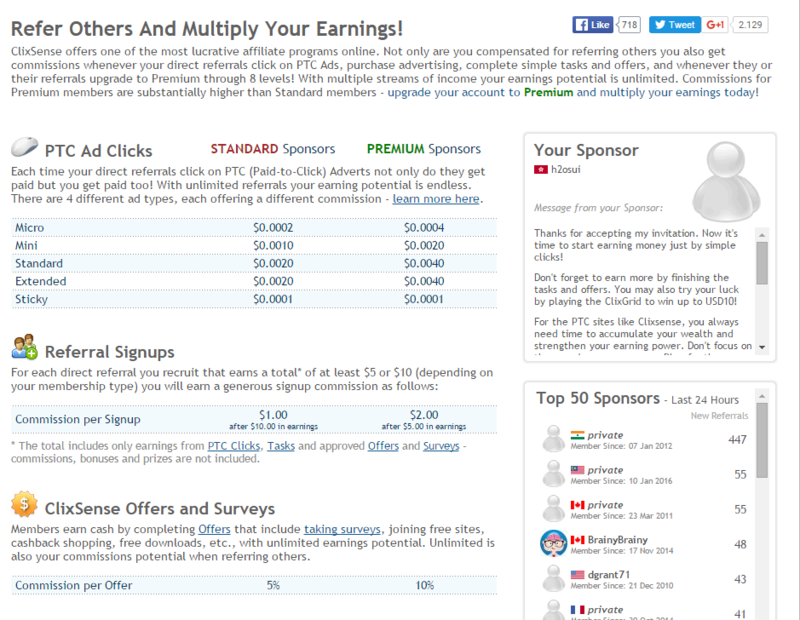 For those members who do not meet this criteria, your affiliate commissions will remain at 20%. 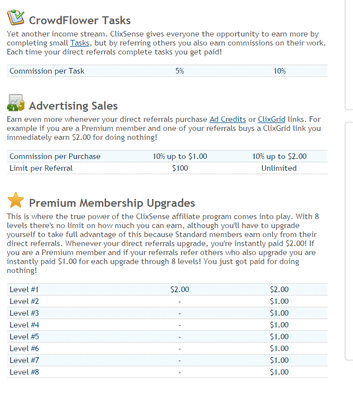 If your looking to try and increase your ClixSense downline, please promote your affiliate URL which can be found on the My Account page. We'd like to thank you for your continued support of ClixSense. Members, there is currently an issue with Payza not returning IPN to our server so several hundred Payza cashouts were not completed. You will see a status of processing in your account for your latest cashout. We have been in contact with Payza and we hope to get this matter solved as soon as possible. If you had a pending Payza cashout that has disappeared from your account, please do not write in to us. We are aware of this and working to get it corrected ASAP. For the next 12 days (Starting Friday December 22nd and ending on Tuesday January 2nd, 2018) we are increasing the daily checklist bonus an additional 50%. During this promotion all members will earn an 18% bonus for completing their checklists! Thank you for your continued support through our many changes that occurred in 2017. 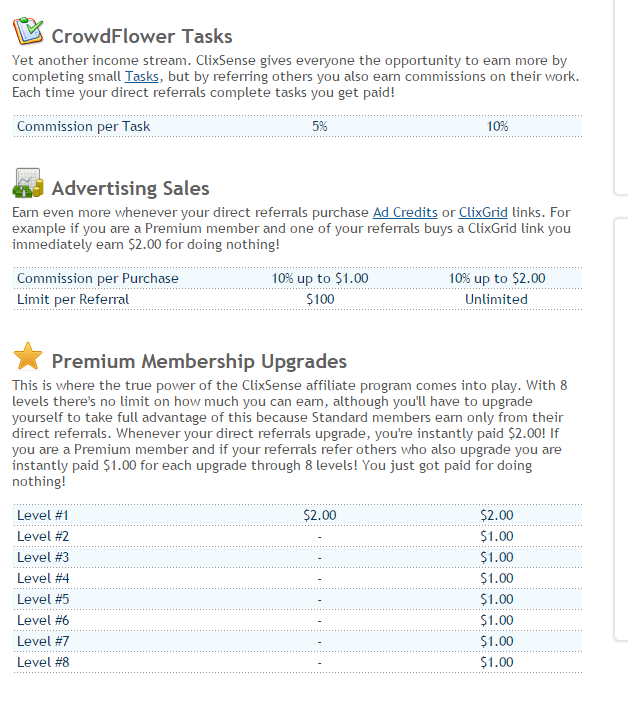 Clixsense is my favorite money earning site. The earning strategy is little low but one can make good amount of money on Clixsense. Earning from self activities on clixsense is worth doing. Along with doing jobs if one can recruit direct referrals than he can earn money without any effort. "Recently we switched our supplier of Bitcoin rewards from Snapcard to Wyre because Snapcard discontinued operations. With the change, we had anticipated minimal customer and end-user impact. However, the recent changes in crypto-currency regulations, including increased identity and account verification and an increase in the minimum denomination/amount available to send or transfer Bitcoins, has caused poor end-user experience. Our goal is to provide recipients with a hassle-free reward experience. After reviewing all aspects of the switch, we decided it would be best to remove Bitcoin from our catalogs. This decision did not come lightly and we apologize for how this will impact your own programs." Tango Card has advised us they are adding new options on their platform for our international members. We should have these new options in Tango in the next week. In the meantime we suggest that if you wish to use Tango Card that you select the Prepaid Virtual Visa. Payza - I am sorry for the continued delay. The new bank account we setup to send our wires has placed a 10 day hold on the funds we deposited as it was a very large deposit. We are told the funds will be available for us to wire to Payza this week so ALL pending Payza cashouts will be completed soon. I want to thank you for your patience during this time. Members, I would like to apologize for the delay with Payza cashouts. Recently, we were informed by our bank that Western Union (which processes most wire transfers for banks) has blacklisted Payza due to an apparent investigation with the US Securities and Exchange Commission. This blacklisting of Payza by Western Union has limited our ability to send funds from our bank account to our Payza account. We have been in touch with Western Union and our bank to see if we can come up with a work around for this issue. We will keep you updated on our progress and hope for a positive result. In the meantime if you'd like to cancel your pending Payza cashouts so you can use an alternate method, just go back to the My Account page and click Cancel next to your pending cashout or submit a ticket to us and we'll be glad to assist. Also, we have been working on adding new ways for you to make payments to us and we've been in contact with many companies to try and find the a much easier way for you to get your money. We should have an update on this very soon. I would like to thank you for your patience and understanding. ClixSense Chat allows you to instantly PM (private message) a ClixSense member as long as you know their username. With ClixSense Chat you have full control over whether or not you want to talk to someone and you can even block a person from contacting you. You also have the option to report a person who you think may be abusing the chat or spamming. Please note: Spamming, sending offending messages, name calling or abusing the chat system in any way will result in immediate removal from chat and may also lead to the suspension of your ClixSense account. To start a conversation just click on a username found on the forum or on your referrals page. ClixSense Chat may only be used while logged into your ClixSense account and you may receive messages from other members while you are offline. On the top menu there is a Chat link, if you see a number next to this link that number represents the total number of unread messages you have. On the chat box in the upper right corner there's a menu button, clicking this button will give you the chat options. Please familiarize yourself with these options before using chat. Please be sure to report to us any issues you may have and please remember to be respectful to your fellow members. Members, we are pleased to announce the addition of Payoneer for cashouts. Payoneer allows you to send your ClixSense cashout directly to your bank account or to a Payoneer Card (The Payoneer card is not available to all countries). 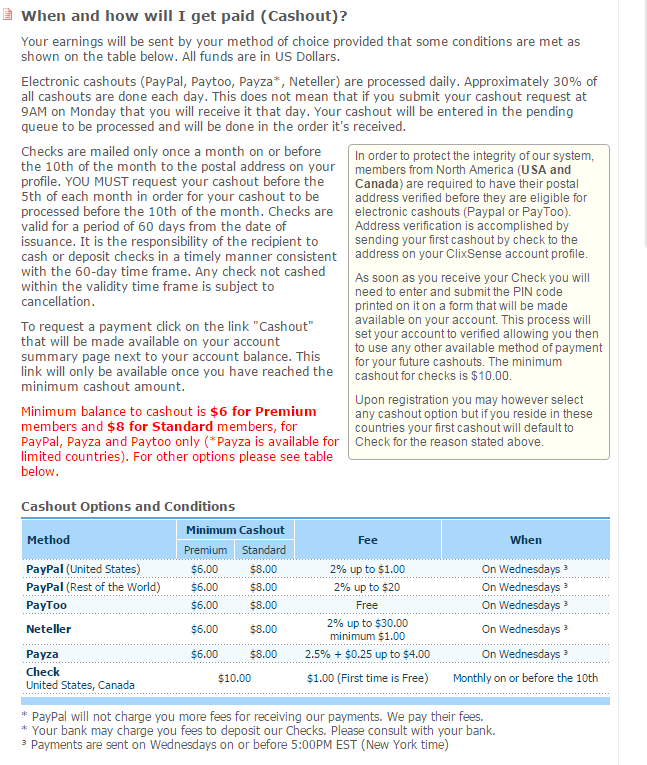 Please note the minimum cashout through Payoneer is $20.00, however the minimum you can send from your Payoneer account to your bank account varies by country starting at $25.00. Be sure to check the fee schedule before requesting your bank transfer. For those of you who already have a Payoneer account you can now "link" your Payoneer account with your ClixSense account. To do this, please go to the Profile and Settings link on your account. Then on the right under Payment Details select Payoneer from the dropdown menu. Then click "Connect your Payoneer account now!" This will take you to the Payoneer login page where you will be asked to login to your Payoneer account. Once you are logged in, it will link your Payoneer account to your ClixSense account. At this point you can request a cashout through Payoneer. If you do not have a Payoneer account and wish to register. Please go to the Profile and Settings link on your account, select Payoneer from the dropdown menu on the Payment details section and click the Create one link. Payoneer will verify your account details before your account is active. This may take 24 hours or longer. Payza and Neteller will be removed as a cashout option but if their banking situation changes we will bring them back. We're also still looking into Bitcoin processors so please stay tuned. Members, first would like to wish you and your family a very happy holiday. We would like to let you know that on Christmas day we will have very limited support if any available as we will be enjoying the Christmas holiday. With the limited staff we have available, helpdesk tickets, the approval of ads, ClixGrid and ad credits will be delayed until Monday morning December 26th. We ask that if you have any questions or plan to purchase advertising to please wait until we are available on Monday so you do not experience a delay. Thank you for your understanding and Happy Holidays. The odds of winning on the ClixGrid game during this period have also been significantly increased, so don't miss out on this incredible opportunity. Thank you for being with us in 2016. We look forward to seeing you in 2017 as we have some exciting changes on the way! Happy Clicking and Happy Holidays! Members, it appears there is an issue on the Paypal platform that is causing our payments to be delayed. If you check the status of your Paypal cashout and it says processing then your cashout was done but not yet processed by Paypal. We're not sure how long it will take for them but Paypal did post a message on their system status page that there is an issues on their platform. Members, today is Thanksgiving and a National Holiday here in the USA. We will have very limited staff online throughout the day as most of us will be enjoying the day with our families (and watching football...lol). Members, it has come to our attention that some advertisers are attempting to use sneaky tactics to get you to open an attachment or popups in an ad. We do not allow any popups or auto downloads in ads so it you happen to see anything like this first do not open it, regardless of what it says. Secondly report the website to us so we can remove it. Some of these downloads may say, ClixSense $20.00 winner, or ClixSense prize or something else to get you to open it. We will NEVER put anything in an ad like this so DO NOT OPEN THESE and report them immediately. Our local news has the hurricane reaching us about 2am EST this weekend and still being a category 2 storm. (www.wect.com/story/33…rent-track) We are near Wilmington on this map. We wanted to keep you up to date on this developing situation incase there are any delays. 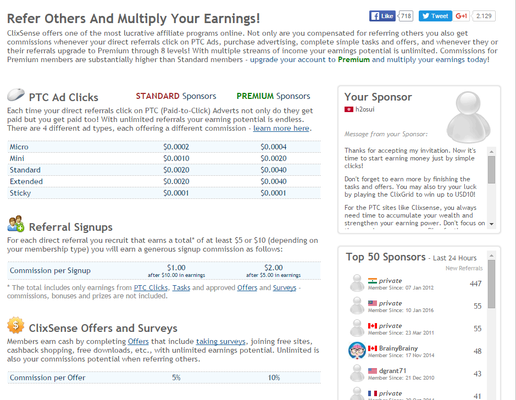 Members we have just added 30 new affiliate banners you can use for advertising. A brand new look with different colors. The ClixSense servers were not hacked and all of our servers are still intact and your account information was not effected. As I said above, its a DNS hack. It may take a bit for the site to fully come back online due to propagation but it will be back as soon as possible. We apologize for the length of time we will be offline but this upgrade is necessary and will help ensure that as we continue to grow you do not experience a slowdown in our website performance. For those members who had an unknown purchase of ad credits on your account, please note this issue has been resolved and your account has been credited back. We apologize for the confusion but an update that was done caused this issue. Members, currently there is an issue with Crowdflower not crediting or updating stats. We are working to resolve it ASAP. Please do not send a helpdesk ticket in about unpaid tasks as once this is corrected all payments should come through. We were recently advised that Paypal will not longer process payments to those members in Turkey starting on June 6th. In order to make sure all of our members from Turkey are paid we have just completed processing all pending Paypal cashouts to those members in Turkey. 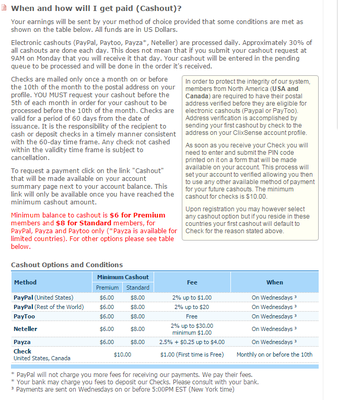 We have also removed the Paypal option from any member from Turkey so there are no accidental cashouts to Paypal. Members, when we first introduced our sticky ads in 2014 we based the price off what we thought the total amount of views per day would be. At that time we averaged roughly 50,000 views per day. Now, with ClixSense continuing to grow and more members online, our average views have increased by more than 50% to over 85,000 views per day. With this large increase it costs us more money per ad. We do not like to raise prices but in order to minimize loses we have to raise the price of our sticky ads 15%. Effective June 10th the new sticky ad pricing will take effect. We have to apologize for keeping this important form of communication disabled for so long. Our forum is now back but unfortunately we were forced to restore it to an old state. This means that some of the data was lost! 9 hours worth to be exact so anything that was submitted after 2016-02-19 07:34am EST is lost, that includes topics, posts, polls, likes, subscriptions, preferences, etc. The Daily Checklist Bonus' Forum View requirement will be restored only tomorrow to give everyone a chance to earn today's bonus.